In 1998–99, with the addition of the Nashville Predators to the NHL, the NHL realigned their divisions and the Avalanche were put in the new Northwest Division. Despite a slow 2–6–1 start, Colorado finished with a 44–28–10 record for 98 points, won the Northwest Division and finished second in the Western Conference. Between January 10 and February 7, the Avalanche had their longest ever winning streak with 12 games. Following the Columbine High School massacre, Colorado postponed their first two playoff games to a later date; they would wear patches in honor of the Columbine victims on their jerseys during the playoffs. After defeating both the San Jose Sharks and the Detroit Red Wings in six games in the first two rounds, Colorado met the Presidents' Trophy-winning Dallas Stars in the Western Conference Finals, where they lost in seven games. Forsberg, the playoffs' leading scorer with 24 points (8 goals and 16 assists),  was again elected to the NHL's First All-Star team and Chris Drury won the Calder Memorial Trophy for the best rookie of the season. Together with Milan Hejduk, both were elected for the NHL All-Rookie Team at the end of the season. Finally, in July 2000, the Avalanche, Nuggets and Pepsi Center were finally bought by real estate entrepreneur Stan Kroenke in a $450 million deal. Kroenke is the brother-in-law of the Lauries—his wife Ann is Nancy Laurie's sister. Liberty retained only a 6.5% stake of the sports franchises. As part of the deal, Kroenke placed the teams into a trust that would ensure the teams will stay in Denver until at least 2025. After the deal, Kroenke organized his sports assets under Kroenke Sports Enterprises. In the 2001–02 season, Colorado finished the regular season with 99 points from a 45–28–8–1 record and won the Northwest Division. Colorado had the league's lowest goals conceded: 169, an average of 2.06 per game. The NHL season was interrupted once again for the 2002 Winter Olympics, in Salt Lake City. The Avalanche had nine players representing six countries. Canada won the ice hockey tournament and Rob Blake, Adam Foote and Joe Sakic won gold medals. American Chris Drury got a silver medal. With the win, Blake and Sakic became members of the Triple Gold Club. The Avalanche advanced through the first two rounds of the playoffs winning 4–3 against the Los Angeles Kings and 4–3 against the San Jose Sharks. Patrick Roy had a shutout on the decisive game of each series. The Avalanche made the Western Conference Finals for the fourth consecutive season (and sixth overall in the last seven seasons), meeting the Detroit Red Wings in the playoffs for the fifth time in seven years. Colorado had a 3–2 lead after five games, but lost Game 6 at home 2–0 and then the Red Wings won the deciding game at Detroit, 7–0. As in 1997, Detroit went on to win the Stanley Cup. Peter Forsberg was the playoffs' scoring leader with 27 points (9 goals, 18 assists). 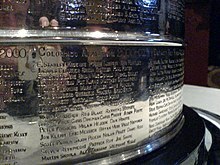 Patrick Roy won the William M. Jennings Trophy, given to the goaltenders of the team with fewest goals scored against. Roy was elected for the NHL's First All-Star Team, together with Joe Sakic. Rob Blake was elected for the Second All-Star Team. The following season, 2002–03, saw the Avalanche claim the NHL record for most consecutive division titles, nine,  breaking the Montreal Canadiens' streak of eight, won between 1974–82. The division title came after a bad start by the team, that led to the exit of head coach Bob Hartley, in December. General manager Pierre Lacroix promoted assistant coach Tony Granato, who had only three months of coaching experience as an assistant, to the head coach position. The team's playoff spot seemed in doubt at one point, but the Avalanche managed to finish with 105 points, ahead of the Vancouver Canucks by one. The race to the title was exciting, namely the second-to-last game of the season, as the Avalanche needed to win the game to stay in the race, and Milan Hejduk scored with ten seconds left in overtime to defeat the Mighty Ducks of Anaheim. 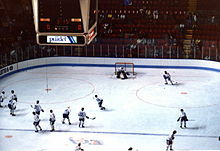 The title was guaranteed in the final day of the regular season, when the Avalanche defeated the St. Louis Blues 5–2 and the Vancouver Canucks lost against the Los Angeles Kings 2–0. In the Western Conference Quarter-finals, the Avalanche blew a 3–1 series lead over the Minnesota Wild, and lost in overtime in Game 7. Peter Forsberg won the Art Ross Trophy for the leading scorer of the regular season, which he finished with 106 points (29 goals, 77 assists). Forsberg also won the Hart Memorial Trophy for the regular season's most valuable player and shared the NHL Plus/Minus Award with teammate Milan Hejduk. 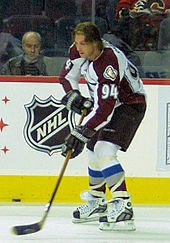 Hejduk scored 50 goals to win the Maurice "Rocket" Richard Trophy, awarded annually to the leading goal scorer in the NHL. Forsberg was elected to the NHL's First All-Star Team; Hejduk was elected to the Second All-Star Team. During a game against the Canucks on March 8, 2004, Canucks player Todd Bertuzzi punched Colorado's Steve Moore from behind, leaving Moore unconscious. It was said to be retaliation for a hit Moore had delivered to Canucks captain Markus Naslund the month before. Because of the punch and the consequent fall on the ice with Bertuzzi on top of him, and numerous other players from both teams piling on top, Moore sustained three fractured neck vertebrae, among other injuries, that ended his career. Bertuzzi was away from professional hockey for 17 months as a result of suspensions. 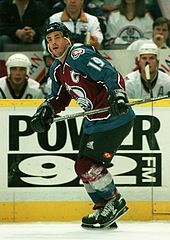 In Denver, ever since the Moore hit, it has become tradition for the home fans to boo Todd Bertuzzi every time he gains possession of the puck, whenever his team faces the Avalanche at Pepsi Center. 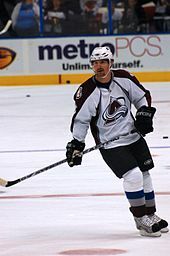 By the beginning of the 2006–07 season, Joe Sakic and Milan Hejduk were the only two remaining members from the 2000–01 Stanley Cup-winning squad. Sakic was the only player left from the team's days in Quebec, though Hejduk was drafted by the Nordiques. Paul Stastny, son of Nordiques legend Peter Stastny, also provided a link to the franchise's past. Before the previous season's playoffs, in a move reminiscent of Patrick Roy's trade, the Avalanche traded goaltender David Aebischer to the Montreal Canadiens for the Vezina Trophy-winning Jose Theodore. However, the move would not turn out to be as successful. Theodore posted a 13–15–1 record in 2006–07, with an .891 save percentage and 3.26 goals against average (GAA), with his US$6 million salary becoming a heavy burden for the Avalanche in the salary cap era. The Avalanche missed the playoffs for the first time since 1993–94, when they were still in Quebec. The team had a 15–2–2 run in the last 19 games of the season to keep their playoffs hopes alive until the penultimate day of the season. 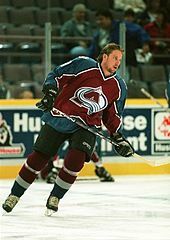 A 4–2 loss against the Nashville Predators on April 7, with former player Peter Forsberg assisting the game-winning goal scored by another former player, Paul Kariya, eliminated Colorado from the playoff race. As consolation, the team won the last game of the season against the Calgary Flames the following day and finished fourth in the Northwest Division and ninth in the Western Conference with a 44–31–7 record for 95 points, one less than eighth-seeded Calgary. Nonetheless, the result was greater than expected by hockey pundits; Sports Illustrated previewed before the start of the season that the Avalanche would finish 13th in the Western Conference. During that last game of the season, Joe Sakic scored a goal and two assists and became the second-oldest player in NHL history to reach 100 points, behind only Gordie Howe, who had 103 points at age 40 in the 1968–69 season. During the season, Paul Stastny set an NHL record for longest point streak by a rookie, with 20 games,  three more than the previous record, held by Teemu Selanne  and Karlis Skrastins set a new NHL record for the longest game streak by a defenseman, with 495 games. 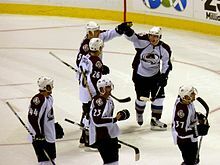 Until the Avalanche's 2006–07 season, no team in the history of the NHL had ever made it to 95 points without earning a spot in the playoffs. In the Eastern Conference, three teams progressed to the playoffs with fewer than 95 points: the New York Rangers (94), the Tampa Bay Lightning (93) and the New York Islanders (92). 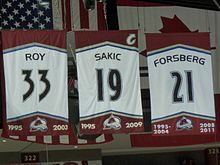 Peter Forsberg's number 21 became the fourth jersey number retired by the Avalanche on opening night, a contest Colorado would lose to Detroit 3–0. Colorado redeemed themselves in game two of the season on October 10, 2011, against the 2011 Stanley Cup champion Boston Bruins. Varlamov negated all 30 shots registered by Boston and posted the fifth shutout of his career and first win as an Avalanche in the regular season. Milan Hejduk scored the game-winning goal and first goal of the season for the club in a 1–0 victory over the defending champions. In April 2012, the Avalanche were eliminated from playoff contention and finished 11th place in the Western Conference. Despite a 20-point improvement from last season's efforts, the team failed to reach the playoffs for the second-straight year, the first time the Colorado club would do so in their 17 years playing in Denver. Head coach Joe Sacco signed a two-year contract extension shortly after the end of the season. Stand out rookie Gabriel Landeskog overtook Matt Duchene as the youngest in franchise history to lead the team in goals, scoring 22 in 82 games. After a disappointing 2012–13 season which saw the Colorado Avalanche finish 15th in the Western Conference and 29th overall in the League, it was announced on April 28, 2013, that head coach Joe Sacco had been relieved of his duties. On May 10, it was announced that former long-time Avalanche captain and Hockey Hall of Famer Joe Sakic is set to take on an expanded role in Avalanche management, being named executive vice president of hockey operations, overseeing all matters involving hockey personnel. It was also announced that Josh Kroenke, son of owner Stan Kroenke, is now president of the Avalanche, succeeding Pierre Lacroix. On May 23, Patrick Roy returned to the Avalanche as head coach and vice president of hockey operations. Although Sherman retained his role as general manager, he was largely reduced to an advisory role. Roy and Sakic now share most of the duties held by a general manager on most other NHL teams, though Sakic has the final say on hockey matters. Just prior to the start of the 2014–15 season, Sakic was given the title of general manager while Sherman was demoted to assistant general manager, thus formalizing the de facto arrangement that had been in place since 2013. Despite the front office changes, the Avalanche failed to qualify for the 2015 playoffs after finishing with a record of 39–31–12, resulting in a seventh-place finish in the Central Division. The road jersey from 1995 to 2003, which became the team's home jersey in 2003 when the NHL decided to switch home and road jerseys,  is predominantly burgundy and dark blue in color. Along the jersey, there are two black and white zigzag lines, one in the shoulders, the other near the belly. Between them, the jersey is burgundy, outside those lines it is dark blue. Similar lines exist around the neck. The Avalanche logo is in the center of the jersey. On top of the shoulders, there is the alternate logo, one on each side. The away jersey is similar but with different colors. The burgundy part on the home jersey is white on the away jersey, the light blue part is burgundy and the black and white lines became gray and blue. The Avalanche introduced a third jersey during the 2001–02 season. It is predominantly burgundy. "Colorado" is spelled in a diagonal across the jersey where the logo is on the other jerseys. From the belly down, three large horizontal stripes, the first and the last being black and the middle one being white. In the middle of the arms, there are five stripes, black, white and burgundy from the outside inside in both sides. On the shoulders is the primary "A" logo. 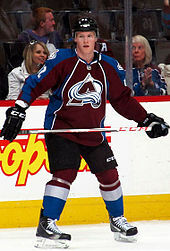 The third jersey was not worn by the Avalanche for the 2007–08 or the 2008–09 seasons after the NHL switched to the Reebok Edge jerseys. In the 2009–10 season, the Avalanche introduced a new third jersey that was worn for the first time during the November 14, 2009 home game against the Vancouver Canucks. It is similar to the club's previous third jersey, but is primarily blue instead of burgundy and features burgundy patches on the shoulders with the "A" logo inside. It also does not have horizontal striping on the bottom. On the arms, there are five stripes, burgundy, white and black from the outside inside in both sides. They are closer to the elbows than the stripes on the previous third jerseys. Note: This list of team captains does not include captains from the Quebec Nordiques ( WHA & NHL). Note: This list does not include general managers from the Quebec Nordiques ( WHA & NHL). In the following season, in the last regular season meeting between the Avalanche and the Red Wings on March 26, 1997, a brawl known as the Brawl in Hockeytown broke out. The game ended with nine fights, 11 goals, 39 penalties, 148 penalty minutes, one hat-trick (by Valeri Kamensky) and a goaltender fight between Stanley Cup champion Patrick Roy and Mike Vernon. Claude Lemieux was one of the players singled out by the Red Wings players. The Red Wings ended up winning the game in overtime 6–5. The teams met again in the Western Conference Finals that season, with the Red Wings emerging victorious and going on to win the Stanley Cup. These are the top-ten point-scorers in franchise (Quebec and Colorado) history. Figures are updated after each completed NHL regular season. ^ a b "Colorado Avalanche history". Hockey-Reference.com. Retrieved November 15, 2018. ^ "Lindros: Refusal to play for Nordiques 'was about an owner,' not a city". theScore.com. Retrieved November 15, 2018. ^ Burfiend, Dustin (June 3, 2010). "An Interesting Parallel: '92-'93 Quebec Nordiques". Mile High Hockey. Retrieved December 24, 2018. ^ "1994-95 Quebec Nordiques Roster and Statistics". Hockey-Reference.com. Retrieved December 24, 2018. ^ "NORDIQUE SALE REUNITES NHL, DENVER". DeseretNews.com. May 26, 1995. Retrieved December 24, 2018. ^ "NHL Presidents' Trophy Winners". Hockey-Reference.com. Retrieved November 14, 2018. ^ a b c "1997 NHL Stanley Cup Playoffs Summary". Hockey-Reference.com. Retrieved November 14, 2018. ^ "Legends of Hockey -- NHL Player Search -- Player -- Sandis Ozolinsh". hhof.com. Retrieved November 14, 2018. ^ a b "1997-98 Colorado Avalanche Roster and Statistics". Hockey-Reference.com. Retrieved November 15, 2018. ^ Staff, From; Reports, Wire (May 28, 1998). "Avalanche Says That Crawford Quit Job". Los Angeles Times. Retrieved November 15, 2018. ^ Press, The Associated. "N.H.L. : COLORADO; Hartley Picked To Coach Avalanche". Retrieved November 15, 2018. ^ "Bourque relishes memory of winning Stanley Cup". National Hockey League. Retrieved November 15, 2018. ^ "1999-00 Colorado Avalanche Roster and Statistics". Hockey-Reference.com. Retrieved January 4, 2019. ^ "1998-99 Colorado Avalanche Roster and Statistics". Hockey-Reference.com. Retrieved January 4, 2019. ^ "MacKinnon Named To NHL's Second All-Star Team". National Hockey League. Retrieved November 15, 2018. 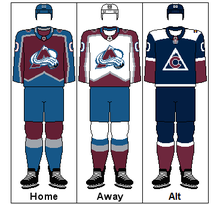 ^ "Colorado Avalanche Team History". go.rauzulusstreet.com. Retrieved November 15, 2018. ^ "Lacroix stepping down as Avalanche president". May 10, 2013. ^ "Nashville Predators at Colorado Avalanche Box Score — April 7, 2007". Hockey-Reference.com. Retrieved November 26, 2018. ^ STAPLETON, ARNIE (April 9, 2007). "Sakic Reaches 100 Points As Avs Win". Retrieved November 15, 2018. ^ "Behold your father's Avs". The Denver Post. February 26, 2008. Retrieved November 26, 2018. ^ "Tony Granato returning as head coach of the Colorado Avalanche". National Hockey League. Retrieved November 15, 2018. ^ "Colorado Avalanche's decline has left fans disillusioned". The Denver Post. April 6, 2013. Retrieved November 15, 2018. ^ a b "The 2008-09 Avalanche season" (PDF). SB Nation. Retrieved November 15, 2018. ^ "2008-09 Colorado Avalanche Roster and Statistics". Hockey-Reference.com. Retrieved November 15, 2018. ^ "Avalanche fire GM Giguere". Sports Illustrated. Retrieved November 15, 2018. ^ "Sakic-less Avalanche start to rebuild - NHL.com - News". www.nhl.com. Retrieved December 24, 2018. ^ September 11, CBC Sports ·. "Foote replaces Sakic as Avalanche captain". CBC. Retrieved December 24, 2018. ^ "Sharks vs. Avalanche - Game Recap - October 1, 2009". ESPN. Retrieved December 24, 2018. ^ "2010 NHL Playoffs - Conference Quarterfinals - Sharks vs. Avalanche - ESPN". ESPN.com. Retrieved December 24, 2018. ^ Wertheim, L. Jon. "THE MOST POWERFUL MAN IN SPORTS ... YOU HAD NO IDEA, DID YOU? STAN KROENKE". Vault. Retrieved December 24, 2018. ^ "2009-10 Colorado Avalanche Roster and Statistics". Hockey-Reference.com. Retrieved December 24, 2018. ^ "Joe Sacco fired as coach of Colorado Avalanche after four NHL seasons". The Denver Post. April 28, 2013. Retrieved December 24, 2018. ^ a b "2010-11 Colorado Avalanche Roster and Statistics". Hockey-Reference.com. Retrieved December 24, 2018. ^ "2010-11 Colorado Avalanche Schedule and Results". Hockey-Reference.com. Retrieved December 24, 2018. ^ "Matt Duchene's curious contract with Colorado". sports.yahoo.com. Retrieved December 24, 2018. ^ "Forsberg halts comeback, retires from hockey". ESPN.com. February 14, 2011. Retrieved December 24, 2018. ^ "Peter Forsberg Stats". Hockey-Reference.com. Retrieved December 24, 2018. 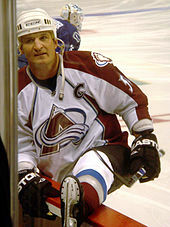 ^ "Avalanche captain Adam Foote shares his thoughts on retirement". The Denver Post. April 8, 2011. Retrieved December 24, 2018. ^ Sadowski, Rick. "Jared Bednar hired as Avalanche coach". National Hockey League. Retrieved April 23, 2018. ^ "Avalanche 2016–17 Season in Review: Colorado sinks to new low – The Denver Post". April 7, 2017. Retrieved April 26, 2017. ^ Rosen, Dan. "Duchene traded to Senators by Avalanche". National Hockey League. Retrieved April 23, 2018. ^ Farrell, Sean. "Canadiens stop Avalanche winning streak at 10". National Hockey League. Retrieved April 23, 2018. ^ Associated Press. "Avalanche head back to playoffs after win over Blues". Sportsnet.ca. Retrieved April 23, 2018. ^ Associated Press. "Avalanche stay alive, beat Predators to force Game 6". Sportsnet.ca. Retrieved April 23, 2018. ^ Associated Press. "Predators eliminate Avalanche with blowout win in Game 6". Sportsnet.ca. Retrieved April 23, 2018. ^ "Colorado Avalanche Get 1,000th Win against Anaheim Ducks". Mile High Sticking. November 19, 2018. Retrieved November 26, 2018. ^ "The Colorado Avalanche's new uniforms are here, and they look good". Denverite. Retrieved November 15, 2018. ^ "Avalanche Blows It With Lousy Jersey Design". Mile High Hockey. Retrieved November 15, 2018. ^ "Pass or Fail: Colorado Avalanche new third jersey for 2015-16". sports.yahoo.com. Retrieved December 24, 2018. ^ "New Avalanche uniforms revealed for 2017-18 season". The Denver Post. June 21, 2017. Retrieved December 24, 2018. ^ "On-Air Talent - Altitude Sports". www.altitudesports.com. Retrieved March 28, 2019. ^ "Jared Bednar introduced as new Avalanche coach, plans to retain 3 assistant coaches". The Denver Post. August 31, 2016. Retrieved November 14, 2018. ^ a b c d "Looking back at the bloody Avalanche-Wings rivalry". National Hockey League. Retrieved November 15, 2018. ^ "Detroit Red Wings officially heading to Eastern Conference as NHL approves realignment". MLive.com. Retrieved November 15, 2018.